This is the first post in a occasional series on animals in (mostly) early modern Paris. Last week, a US judge apparently ruled that two research chimpanzees are “legal persons” and have standing to pursue a court case against their captivity. As the work of historian Alan Ross is revealing, non-human primates have long been human companions. In early modern Europe, monkeys were popular pets among royalty and the aristocracy. The French king Charles VI in the late fifteenth century kept a pet monkey, and over a century later Queen Marie de’Medici, mother of Louis XIV, kept a “sapajou” or capuchin monkey (a South American species) and a “guenon,” one of the many species of cercopithecus, an Old World monkey. This seems to have been a popular pairing, immortalized in 1676 in this illustration from the Mémoires pour servir à l’histoire naturelle des animaux. The setting is the terrace of a chateau, with a formal, geometrical parterre in the background. If this was not the actual palace of Versailles, the image was certainly meant to evoke it, and one historian has identified Charles Perrault’s labyrinth in the background. Among all of the animals depicted in this volume, the monkeys are the only ones shown under restraint, with a ball and chains. The chains are delicate, and the monkeys appear to be playing with the single small ball, its form echoed in the fruit another monkey holds. 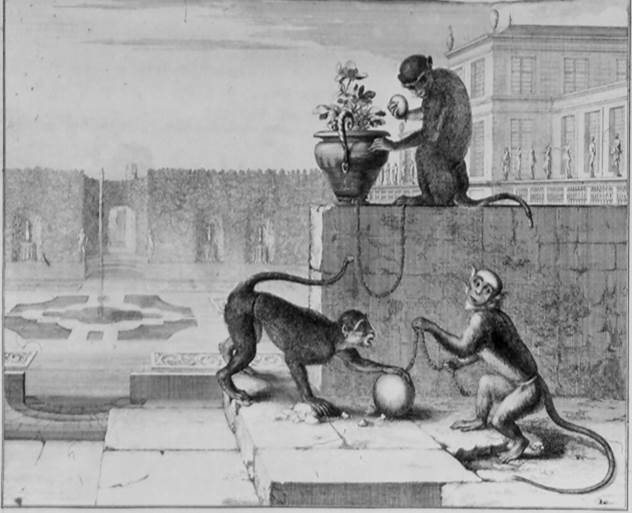 Apart from serving as pets – the royal minister Mazarin also had a pet monkey, who sported the Cardinal’s specially made perfume – performing monkeys and apes were frequently seen at fairs and other spectacles. This image from 1630 shows monkeys clowning around a sleeping man — the phrase in French is “faire des singeries,” to monkey around. The ape Fagotin, who may have been a chimpanzee, had a large following in midcentury Paris. There were at least two of that name. The first flourished in the 1640s in the marionette show of a certain Brioché. According to one source, Brioché was the stage name of father and son puppeteers Pierre and François Datelin; according to another, it was a Gallified version of an Italian name, Briocci. The nineteenth-century chronicler of marionettes, Charles Magnin, even claims that Briocci had some connection to his countryman Mazarin (born Mazzarino). The sources agree that there was a father and a son, and that they gave their performances at the base of the Pont Neuf near the statue of Henri IV and also at the popular fairs of Saint-Laurent and Saint-Germain. Fagotin, who is described as “fat as a pâté of Amiens and big as a small man,” wore an old hat with a large plume and was fully dressed. The description comes from a little 1655 pamphlet that describes how the playwright and duelist Cyrano de Bergerac (1619–55), mistaking Fagotin for a man, ran him through with his sword, much to the dismay of Brioché. This event may have taken place in 1654. Later in the 1650s, a second Fagotin was known as a rope-dancer or tight-rope walker. 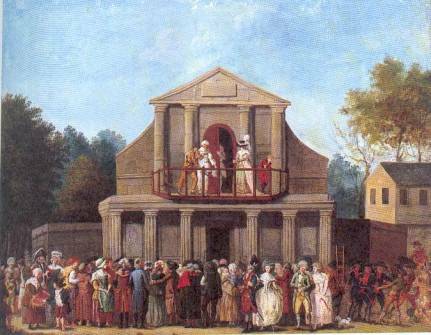 “Fagotin” became a standard name for a performing monkey; a poet in 1664 described “Les fagotins et les guenons” at the Foire Saint-Germain. Fagotin also made appearances in works by Molière and La Fontaine. In La Fontaine’s fable “Le cour du lion,” Fagotin and his marionettes even entertain the king.